September 14, 2018 -- Interim analysis of a randomized controlled trial on digital breast tomosynthesis (DBT) showed the modality took longer to read than digital mammography but had significantly lower recall rates. The Norwegian researchers also found no differences in radiation dose between the two techniques, thanks to the use of synthesized DBT images. The Tomosynthesis Trial in Bergen (To-Be) included all women invited for breast cancer screening in Bergen, Norway. Women were randomized to receive either digital mammography or DBT plus synthesized 2D mammography (a 2D mammogram culled from the DBT dataset). The research team, led by Dr. Hildegunn Aase from the radiology department at Haukeland University Hospital in Bergen, found mean reading time was 1 minute 11 seconds for DBT and 41 seconds for digital mammography (European Radiology, 29 August 2018). "We expected longer reading time for DBT than for digital mammography, and I was actually a bit surprised that the radiologists did not take longer for DBT," said principal investigator Solveig Hofvind, PhD, from Cancer Registry of Norway. "The recall rate was lower for DBT than for digital mammography, which was not very surprising, more promising." An example of screen-detected invasive carcinoma (dorsal positioning). It was difficult to see on 2D (left) but clearly visible on DBT (right). All images courtesy of Dr. Hildegunn Aase and Solveig Hofvind, PhD. Radiologists are constantly seeking ways to improve breast cancer detection. Could DBT be the answer? Some studies examining DBT add in 2D digital mammography, which raises the radiation dose for patients. Could DBT plus synthesized 2D mammography replace digital mammography altogether? And what does using DBT plus synthesized 2D mammography do to reading times and recall rates? That's precisely what Aase, Hofvind, and colleagues sought to discover. They started the To-Be trial in January 2016, spanning one screening round of two years. The current study reports the interim results from the first year of the trial. A total of 7,155 women were randomized to DBT (SenoClaire 3D, GE Healthcare), and 7,119 were randomized to digital mammography (also SenoClaire), all between the ages of 50 and 69. 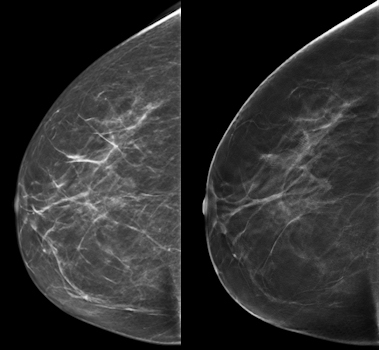 The standard reading protocol included two views of each breast for digital mammography and two-view synthesized mammograms and 1-mm planes of each breast for DBT. The results are summarized in the table below. The target mean glandular dose for DBT using automatic exposure control was equivalent to the mean glandular dose per view for digital mammography, an expected ratio of approximately 1, according to GE. "The absence of a difference between mean glandular dose with DBT and digital mammography observed in our study is, therefore, in line with how the system is set to operate by the manufacturer," the authors wrote. The overall recall rate for women of all breast densities was 3.6% for digital mammography versus 3.0% for DBT, while the recall rate for women with dense breasts did not differ -- 3.6% for both. "The effect of mammographic density on the risk of recall tended to be larger for DBT than for digital mammography, a relevant finding in a breast cancer screening program given that it applies to the larger proportion of screening attendees in our population," they wrote. "Given the established knowledge about the increasing risk of breast cancer with mammographic density, the increase in recall rate with density seems reasonable." Regarding the consensus rates, the results, which demonstrated a lower percentage of cases needing to be discussed at consensus, suggest that DBT may reduce the percentage of cases needing third arbitrating reads in other programs. Aase and Hofvind cautioned that the results are only for the first year of the trial, which might be considered a learning period -- further analyses including a longer study period might yield different findings. In fact, that's precisely what they are doing -- conducting the To-Be 2 trial, which started enrollment in January 2018. The new trial will compare the screening outcome among women with a prior digital mammogram versus a prior DBT. The researchers will also follow participants for interval breast cancer.